We thank everyone who came and supported this event! We Apologize for any inconvenience, but we had to reschedule this event due to uncertain weather. Our “Youth & Family Fun-Ucation Day will be Saturday, July 8, 2017 and start at 8:00am. This is due to a death in the family and a funeral being scheduled on the same day. “U Can” Community Organization is hosting our 1st Annual “Youth & Family Fun-Ucation Day” Event. We are bringing Solutions together for this event. 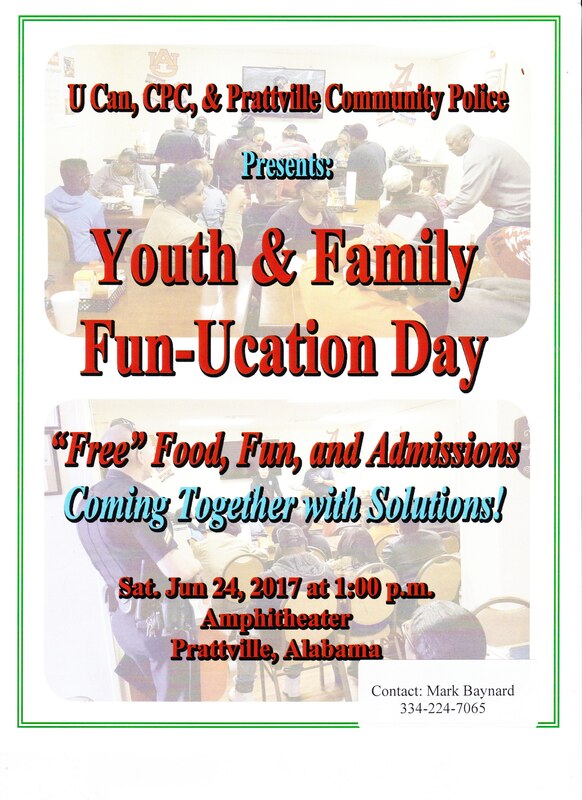 This event is scheduled for Saturday, July 8, 2017at 8:00am at the Amphitheater in Prattville, Alabama. We will have fun activities, free food, and available services for our youth. Come out and support this great event.